Coming up with creative party ideas is a great way to turn an ordinary bash into something special. Since summer time parties are some of the most memorable of the year, the 4th of July is a great opportunity to bring everyone together and celebrate. This holiday can be fun for people of all ages, so be sure to include activities that the entire family will enjoy. The decorations will set the stage for your party. Be sure to purchase plenty in traditional patriotic colors. To greet your guests, tie red, white and blue balloons on the mailbox or hang colorful bunting from your front porch. For a nighttime party, guide the way with luminaries or twinkling lights. Centerpieces: You can place bowls of water colored with red and blue food coloring on each table, and add white carnations with the stems cut off. Paint vegetable cans in patriotic colors and designs, and put bundles of sparklers in each can, which can later be distributed to the kids. Chairs: Tie red, white, and blue helium-filled balloons to the backs of chairs. 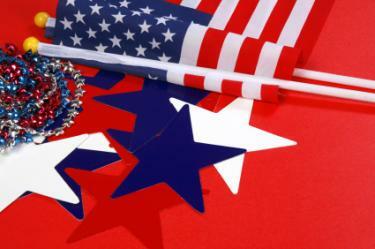 Tableware: Purchase paper plates, napkins, and cups in patriotic colors or with a star-spangled graphic theme. Lighting: String festive lights around the buffet table, hang them in entryways, or line the backyard in their glow. Extras: Sprinkle star confetti on tabletops. Use cutout stars as nametags and place cards. Keep in mind that many party supply stores carry all-inclusive kits which have everything you will need to decorate in style. You may even find decorations at local dollar stores or discount stores as well. Plan a few activities to get the festivities kicked off. If the day is warm and you want to keep your guests cool, anything water related will be appreciated. If you have a pool, swimming and playing water games are a must. Even without a pool, there are plenty of activities to keep your guests, both adults and kids, busy all day. Hang a large patriotic tablecloth up against a fence to serve as a backdrop. Set props, like an Uncle Sam hat, mini American flags, red wagon, mustaches on dowels, oversized sunglasses, and boas, on a table next to the backdrop. Place a camera on a tripod several feet away. Let guests take turns posing in front of the backdrop in funny and festive ways. After the party, print off the photos and mail them to your guests as a fun reminder of the party. Challenge your guests to some American history or Independence day trivia. Before the party, put together a list of facts about United States history. Divide your guests into teams and begin asking the questions. Let guests know they should bring their bicycles on the invitations. Have plenty of streamers, tassels, stickers, and other decorations available at the party. Allow guests to decorate their bikes, and then have them ride them through the backyard or around the block at a designated time. People who do not want to participate on their bikes can be spectators who cheer on the parade. Divide guests into two teams, and play a rousing game of softball. Set up a volleyball net and let your guests play a game of volleyball. Set up a horseshoe pit and pair up guests to take turns at tossing horseshoes. You can't have a list of 4th of July party planning ideas without mentioning fireworks. Sparklers, party poppers, Roman candles, and other small fireworks let even young kids get in on the fun. Wait for dusk and then put on a show for friends and family. Follow all safety precautions when using fireworks and supervise children at all times. Check your local regulations on what is legal to use in your area. Add a secondary theme to your party to make it stand out from a traditional 4th of July celebration. 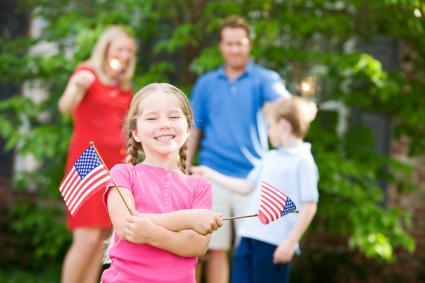 Take your patriotic theme to the next level by incorporating another creative theme into the plans. Turn the 4th of July celebration into a Christmas in July party. You can decorate the area with red, white, and blue Christmas decorations, complete with a tree. Hang lights around the deck or patio and play Christmas music. In addition, serve Christmas cookies and frozen hot chocolate. You can also plan a gift exchange and ask each guest to bring a gag gift to include at the exchange. Set up your party as a picnic. Lay red and white blankets on the yard and cover a picnic table with a festive tablecloth. Serve picnic favorites such as lemonade, watermelon, hot dogs, and chips. Use baskets for your main form of decoration, and to hold utensils and party game supplies. Have Frisbees and kites available as your activities. Put a twist on your celebration by holding a garden party. Decorate the area with bunches of flowers and plants. Ask guests to wear their best "country club" attire in patriotic colors. Serve garden-fresh vegetables and lighter fare such as grilled chicken salad and iced tea. Set up a table for dining outdoors complete with a centerpiece of fresh-cut flowers and a floral printed tablecloth. Plan a classic game, like horseshoes or croquet, as the activity. If you know someone celebrating a birthday close to the 4th of July, make that the theme of your party. 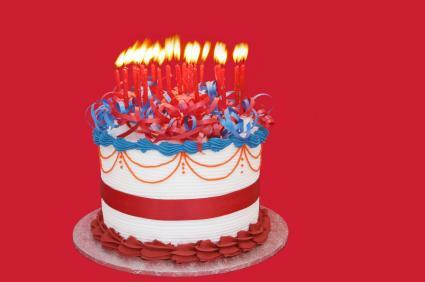 You can have a birthday cake decorated with red, white, and blue sprinkles and flowers. Use sparklers for the candles. Use red, white, and blue streamers and balloons. Hang a birthday banner at the party and give each guest a red, white, or blue party hat. Plan traditional birthday party games with a patriotic twist, like "Uncle Sam Says" or "Pin the Hat on George Washington." Keep the menu for your party simple. Cookouts are a popular option. You can feature grilled meats, salads, and sides. Offer an assortment of 4th of July party foods so that there is something for everyone to enjoy. There are many party ideas to consider that will entertain your guests while making your 4th of July party one of the most memorable of the year. Be creative and have fun, and your party will be a guaranteed success.